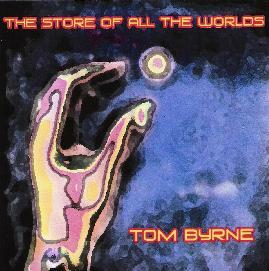 Tom Byrne - "The Store Of All The Worlds"
The Store Of All The Worlds is part III in Tom Byrne's multi-album epic, based on the "Barddas", a purported transcript of the lost oral tradition of the ancient British. [I'm going to take some liberties using Tom's own words to describe the themes of these albums.] Part I - The Last Druids - (see AI #22) focused on the fall of the civilization of these times, attempting to musically describe the loss of lives, land, philosophy and culture. Part II - The Eye Of The Cyclone - (see AI #24) is intended to provide an expression of the beliefs that the protagonists of The Last Druids might have held. The latest in the series is The Stores Of All The Worlds, which uses both current and science fiction themes to describe the day to day experience of the times. There's a lot of detail to convey but I'll leave it to the interested reader to visit Tom's web site for more info. Check it out as this is well researched concept album heaven. Musically the series just gets better with each release. Two things that are new to Store Of All The Worlds is the addition of guitar on some tracks and a singer. The Last Druids was all instrumental, and both that and Eye Of The Cyclone were created solely with Tom's keyboards. The Store Of All The Worlds adds guitar to the mix, compliments of Michael Blackman, who many of you may know from Alien Dream and Space Mirrors, and Kevin Williams, who is credited as being from Fate's Cruel Joke. Plus we've got a vocalist - Tim Pringle. Eye Of The Cyclone had narration by Tom, but the singing on Store is a nice addition. The Celtic influences heard on the first two albums are absent on Store Of All The Worlds, but the album does have a cohesive musical theme, most of the songs having a kind of bouncy groove. Each track transitions seamlessly into the next, making this very much an album to be experienced from beginning to end. It also sounds like Tom might have got his hands on some new equipment since Eye Of The Cyclone as the keyboards sound great. The music is based in classic progressive rock, though, like Cyclone, there are space rock influences to be heard throughout. The album also has a more modern feel, whereas the Celtic stylings on the previous albums helped to create the medieval atmosphere. The "Buddha In The Internet", the spacey prog rock feel and efx'd robotic voices on "Fifth Generation", the narrative style/voice samples of "They're Taking Out A Piece Of My Head" and "Three Minutes", and "Grey Goo", all support the contemporary and sci fi feel that Tom intentionally used to create the music. It all flows beautifully and the music has an enjoyable combination of whimsical vibe, prog symphonics and space rock. (This prog-space rock blend is best exemplified by the excellent "Grey Goo".) A well thought out and constructed blend of music and song, and a good fun listen.